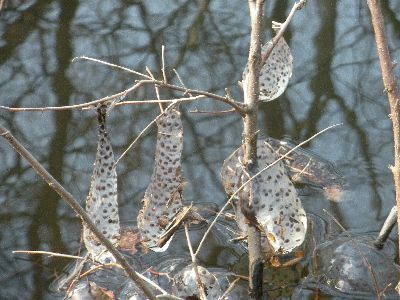 Along the way we saw egg masses along the water’s edge which contained thousands of frogspawn. Seeing these little guys brought back memories from when I was a puny tadpole. I can even remember when my hind legs began to grow–that sure was exciting! I didn’t know it back then, but I have since learned that beyond the confines of the pond where I grew up, a big-wide world filled with adventure was waiting for me! 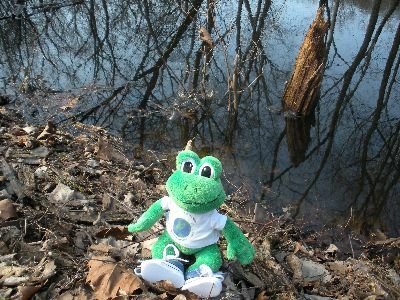 I love being a travel frog! I think this is a good picture of the frog eggs. Tadpoles swim in the pond after they hatch. Tadpoles turn into frogs. Polly loved seeing the eggs. She first thought that they were+ were dinosaurs in the eggs.Polly then thought that the eggs will turn into frogs. Polly loves the tadpoles and the frogs and wants to swim with them. I’m not really sure about the eggs, but there were heavy rains and flooding about a week before. It’s possible that the eggs were hanging because the water dropped. Does anybody else have a possible explanation? Like Zack, I would like to know for sure. Great picture of the frog eggs, but why aren’t they in the water? I love the shoes! Polly looks great! It brings back memories for me too and I’m really happy that I’m a Travel Frog now. Polly are you scared because if you fall you will fall right into the water. Polly can i ask you a question about those things hanging from the tree what are those things.